An emergency kit is something everyone should have. Unfortunately, it does not occur to many people to make one until it is too late. The benefits of having an emergency kit far outweigh the distress of contemplating the worst-case scenario. Important factors to consider are whom you are preparing an emergency for, the kind of emergencies you may encounter and the items appropriate for the people and pets in your care. It’s not just prescription medications you need to have on hand. Remember to pack a travel-size container of over-the-counter allergy medication and pink bismuth (such as Pepto-Bismol). A stash of medications for a 72-hour emergency may be cutting it short. It’s best to have a week’s worth of prescription meds at your disposable. One roadblock you may encounter, however, is that your health insurance won’t throw in those few extra tablets for an emergency kit. Ask your doctor if she has samples of the prescription medications you or your family members take for allergies, blood pressure, asthma or other conditions, and put them in your emergency kit. Missing a dose of some medications can have adverse side effects. For youngsters, you’ll need diapers and formula. The office of Homeland Security suggests packing items to keep kids busy like coloring books and crayons. In an emergency situation, keeping the kids calm and distracted will leave time for parents to take care of business. Band-aids, skin ointment and eye drops are really important. But unless you know how to treat certain wounds, no matter what is in your first-aid kit, you’re still helpless. Ready America (see Resources), a government-sponsored public service, suggests packing a book about first aid. Other important first-aid items include antibacterial towelettes, burn cream and a thermometer. 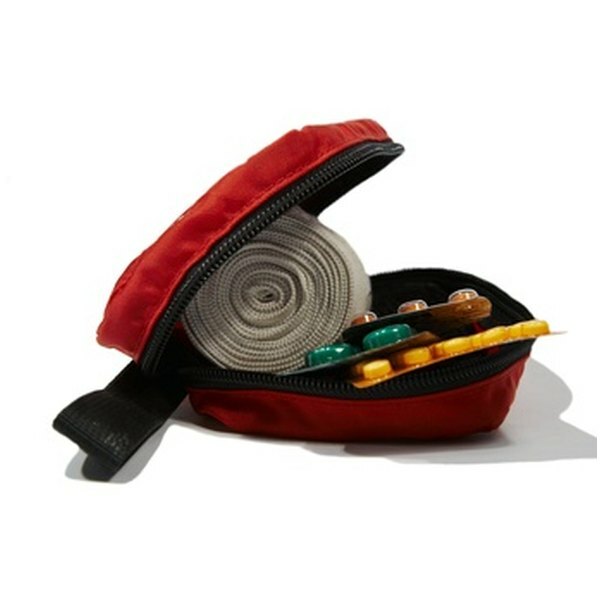 Items in your first aid kit can treat people as well as your pets. If you have pets, you need to have items in your emergency kit for their survival as well. Add a bag of non-perishable food that will last a few days. Some chew toys can help keep an over-excited or hyper dog calm. You should have a three day's supply of non-perishable foods. The California Department of Public Health suggests foods that need no preparation, cooking and only little water. Its list includes ready-to-eat canned meats, fruits and vegetables. Also, protein or fruit bars, granola, canned juices and comfort food. FEMA (Federal Emergency Management Agency) warns against bringing foods that will make you thirsty. So avoid items with a lot of salt and bring those with a high liquid content. In its "Ready" campaign, the Office of Homeland Security states that each person needs one gallon of water per day for both drinking and sanitation. One gallon of water should be enough for a medium-sized pet. Household chlorine bleach (unscented, non-color safe) can be used as a disinfectant. Bleach can also treat water. Check with the office of Homeland Security Emergency Supply List (see Resources) for instructions on how to use bleach in an emergency. Include feminine hygiene items for women. In a waterproof container pack matches and copies of important documents like bank account information and insurance policies. A crank generated emergency radio may be more useful than your cell phone, especially if you have no means for recharging your phone (in a blackout, for instance). Some important tools to have in your kit are a flashlight with spare batteries, candles, can opener, whistle, tweezers and scissors. Most importantly, be sure your kit is easily mobile. One thing you can anticipate about an emergency is that everything will be unpredictable.